It is waaay too early (or late?) for me to be awake, but for some reason I couldn’t sleep. After putting Baby T to bed and crawling ever so slowly (i.e. quietly) into bed, my mind is still swirling with thoughts. We have started Baby T on soft solids and I have been thinking a lot about how to make the new foods palatable to him. I’m probably overthinking it and maybe going a bit overboard since we haven’t even let him try all the “basic” foods yet. Anyways, the commencement of solids means that it’s another thing to do for Baby T, so frankly it’s further reduced my time and focus on making paper flowers. Anyhoo, I still very much enjoy teaching OTHER people how to make paper flowers, so I’ve partnered up with the Aurora Cultural Centre (ACC) to instruct a paper floral workshop at their location in a beautifully-restored 1886 schoolhouse on Saturday April 29th. The ACC is a non-profit, registered charity that delivers a range of diverse art, music, and heritage programs to the community. The paper floral workshop will be a 3-hour (10 am to 1 pm) beginner’s workshop and we will be making peonies. I haven’t decided quite yet what type of peonies as it depends on the type of crepe paper I can obtain, but they’re going to be bright, colourful, and cheery to reflect the season. There is a fee of $48.50 + HST payable to the ACC. Registration is over the phone or in person (a registration form can be downloaded here from the ACC’s website). There is also a material fee of $15 payable to me at the beginning of the class. 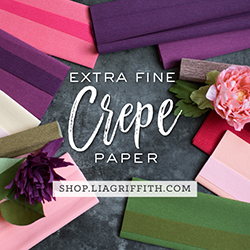 I promise that I’m trying very hard to stretch that $15 to cover the glue, vase, and a variety of crepe paper in different colours, enough for you to take some home so you can continue to make more paper flowers AND to make this paper floral workshop worthwhile and memorable. You can check out the Paper Floral Arrangement Workshop course description on the ACC website for more details. And with that, it’s time for me to go to bed.